The area that is now present-day Jackson, MI can trace its’ origins back as early as 1825, and likely before. Then, the land was inhabited by native Americans, specifically the Potawatomi. Their initial settlement was outside Jackson in what is now Spring Arbor Township. We have great accounts of these people and their settlement as Potawatomi leader, Chief Wabkazhik was involved in, and played an impactful role at, the Battle of Tippecanoe on November 11, 1811. In this battle, he was severely wounded from a gunshot to the leg. he was unsure of his fate but, in a surprising turn of events, he was assisted to the field hospital. He would have surgery to amputate his leg and was then given the means to return home, present-day Spring Arbor, Michigan. Today, at beautiful Falling Waters Historic Park, visitors may view the Potawatomi settlement as it was when the first white settlers began to move into the area some 20 years later. 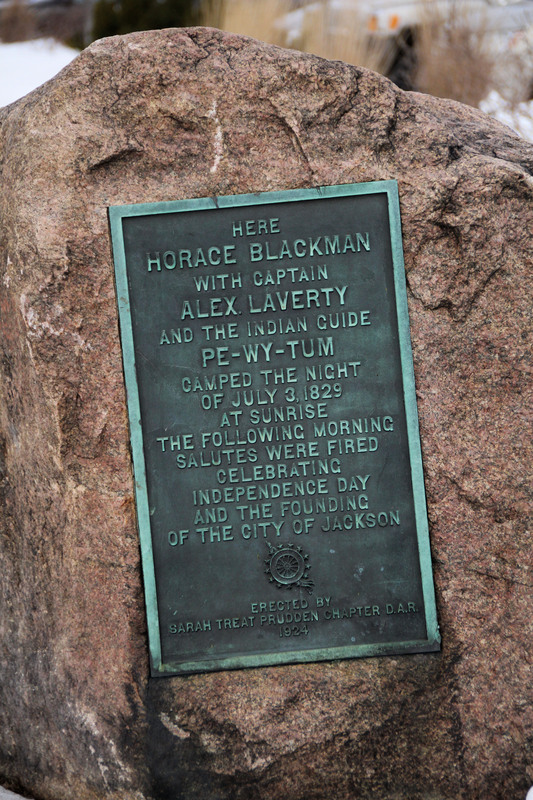 On America’s Independence day, 1829, Jackson as we know it would plant its’ roots along the Grand River as three men: Captain Alex Laverty, Horace Blackman, and their Indian guide Pe-wy-tum, would arrive and set up camp. Their arrival would set the stage for a grand celebration between the new arrivals and the natives. The Potawatomi would host the new men and put on a feast of fish and game, potatoes and corn all hunted or grown by the hands of the natives. While the celebration was great, unfortunately the relationship would not last. As more and more white settlers called the land home, the relationship would face hardship and eventually dissolve. This ultimately led to the driving out of the natives, where they would resettle in what is now Green Bay, Wisconsin.